Don’t go cheap on your signage. Your booth is the face of your business and if your face is ho-hum or worse, it’ll be skipped over. Have a professional make your display, both for the durability you’ll need to go from show to show and for the look. It needs to be clean, crisp and current. You will have only a few seconds to grab the attention of attendees passing by your booth, so make sure they catch a quick and clear image of the name of your company and where your expertise lies. Time your preparations to include some new, juicy information from your business to be released at the show. 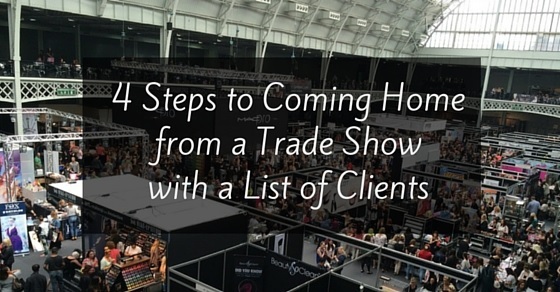 Use social media to create a buzz and let attendees know where you can be found at the show. When people see a crowd around your booth, it lends legitimacy to your company. If everyone else thinks it’s worth spending time getting to know you, maybe they should too. One way to get free coverage is to invite the press. Even if what you do isn’t such a big deal in the grand scheme of things, people like to root for small businesses and sometimes it’s just a slow news day. Write up press releases and send them out ahead of time. If you don’t know how to write a press release, choose an online template, fill in the particulars and get the word out to all your local outlets. It’s worth investing some time in choosing the best reporter for the job in each outlet. This would be whoever covers your field or will be covering the trade show. When a potential client or contact approaches your booth, have someone ready, eager to speak with them. This can be you or a member of your staff. None of you should be sitting in the background, using a cellphone or looking bored. You must be engaged to be engaging. Staff should be well versed on all information pertaining to your product and business, but they should also be told that if and when questions arise for which they are not entirely sure of the answer, that they pass the issue over to you. Staff should spend the majority of their time on their feet, greeting passers-by and politely trying to bring you business. You have worked hard on your setting, brought attention to your brand and trained your staff. This was all setting the stage in order to accomplish your goal of building your client and contact bases. Here’s how you’re going to do it. One will be your run-of-the-mill contacts. These are your raffle prize, collect-them-in-a-fishbowl contacts. See if you can come up with a more creative idea than the see-them-everywhere fishbowl to collect your cards and offer a prize connected to your business field. Make sure to work out an opt-in in order to avoid sending SPAM. This is your running mailing list for your general newsletter. Next is your Golden List. These are your more personal contacts – the people with whom you or your team spoke with personally. If you contact these people with a personalized email immediately after the show, you may well have built yourself invaluable bridges to sales and success. Most importantly, grab those contacts and respect them. Make contact nearly immediately following the show. In your correspondence, include advice and offers that are thoughtful and valuable to your potential clients. Wasting a client’s time by his or her inbox with useless, time consuming junk mail will undo all your hard work. Appreciate your contacts and you’ll feel the love coming right back at you in the form of company success.